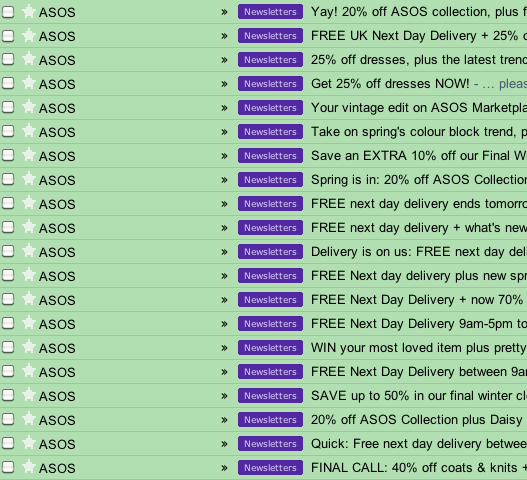 Above is a screenshot of my email account showing the last month or so’s email newsletters from ASOS. You’ve probably noticed it as well, ASOS are offering a lot of special offers at the moment to try and entice you to spend spend spend with them. But is it harming them more than improving sales? The amount of free delivery codes that are sent out every week (or even every day!) will also affect their profit. ASOS Premier is a subscription service where the customer can pay Ã‚Â£25 (currently reduced to Ã‚Â£15) and get free next day delivery for a year. Why bother subscribing though if you can hold out for a few days until the next free delivery email appears? ASOS is still one of my favourite sites for clothes, but these emails are starting to sounding a little desperate. how seriously annoying to be bombarded like that. I almost always ignore ‘special offer’ emails anyway. I guess some people must get tempted by them or they wouldn’t bother. ASOS are driving me MAD with their constant offer emails. I get two of each because they refuse to remove my old email address from their mailing list. Rage. That is annoying! I’m having the same problems with another company that wont unsubscribe me, useless! I’ve bought a few vouchers, but they’ve been for places I wanted to try anyway, or liked going to already. Generally (and this is only for the local deals), they’re for places that were relatively new but even that doesn’t explain why ASOS chose to do it. I don’t understand why ASOS did Groupon, surely they are a better match for local and new businesses? I did buy a voucher and I browse Groupon voucher but ASOS is so hit and miss for me so I often don’t bother! I love ASOS but they seriously do bombard me with emails. I used to read them but now they come practically every day I just delete them now.